One evening many years ago, caught in a sudden downpour on Lower Broadway in NYC, I ducked into a rare gem of a bookstore (Shakespeare & Co.) for shelter. There, on an upper shelf in the back of the store, I discovered a book of historical essays that led me to the story that was to occupy my life for more than two decades, a tale of love, identity and justice, based on events that occurred at the end of WW1, but as relevant today as anything on the morning news. The culmination of this odyssey, CERTAINTY, is my debut novel published on Oct. 21st 2014. With America's entry into World War 1, the population of Newport, Rhode Island doubled as twenty-five thousand rowdy recruits descend on the Naval Training Station. Drinking, prostitution and other depravities follow. Residents including young lawyer William Bartlett feel that the sailors are turning the upscale New England enclave into a moral cesspool. When sailors accuse a respected local clergyman of sexual impropriety, William feels compelled to fight back. 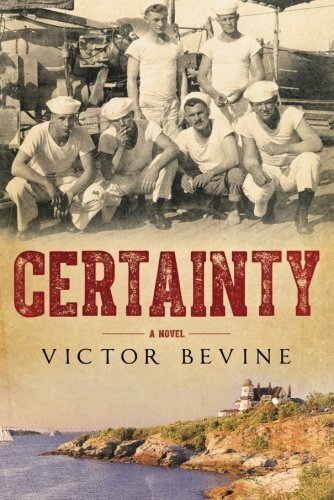 Based on real-life events, Certainty recalls a war-torn ear when the line between right and wrong became dangerously blurred. Click below to read an excerpt and buy the book! Available in print, digital, and audiobook which is narrated by Victor himself. Read an excerpt and buy the book! When you're fighting an injustice, can it be wrong to do what's right? With America's entry into World War I, the population of Newport, Rhode Island, seems to double overnight as twenty-five thousand rowdy recruits descend on the Naval Training Station. Drinking, prostitution, and other depravities follow the sailors, transforming the upscale town into what many residents—including young lawyer William Bartlett, whose genteel family has lived in Newport for generations—consider to be a moral cesspool.